Isle of Wight Challenge – 19th June 2004. “Just one…” was the reply. That was how I found myself at Calshot Spit, on the mainland opposite the Northern tip of the Isle of Wight at 1.30am on a Saturday morning, jumping around in front of the security cameras at Calshot Activity Centre, trying to attract the attention of the security guard who could open the gate to the car park to let the others in. “You guys must be mad” commented the security guard. I couldn’t really argue with his astute observation. Particularly, as I had arranged to borrow a demo P & H Bahiya sea kayak from Bournemouth Canoes, which I had not had time to try out before. Still, what could go wrong with trying a borrowed kayak for the first time at 3am in the morning at the start of a 60 mile circumnavigation? After packing our boats, checking over group communications, a quick look at route timings, and contacting the Coastguard who also probably thought we were mad, we were afloat by 2.50am. I should have spotted the warning signs when Roger announced that we were “already 20 minutes late and we need to catch it up by the Needles”, but at that time in the morning I failed to spot the obvious clues that Roger was ex-military or that he had established a plan with typical military obsession to timings. It was time to try the Bahiya out, to see whether I’d chosen wisely to use a borrowed boat, rather than my own sea kayak. Thankfully, rumours of the boat being very unstable proved to be slightly exaggerated and the boat and I soon settled into a nice partnership. As well as the Romany sea kayak I own and use regularly, I also own a really unstable hard chined wooden Angmassalik sea kayak which put the rumoured instability of the Bahiya into perspective. Our first problem was to identify the lateral port bouyage marking the main channel, which indicated to us where the major tidal flow was. “It’s that one over there, flashing now… now… now..” said Roger, unaware that there were at least two or three others flashing similarly and naturally each of us in the group was now focussed on different flashing lights. Off each of us went, each convinced we were right, and the others were wrong. We quickly sorted out our flashing red light problem, then set off together. It felt like we’d set a fantastic pace, but without daylight it was impossible to gauge just how fast we were travelling at. However, our 4am rest stop (no doubt scheduled with military precision) was an opportunity to look at GPS logs, which showed we’d hit nearly 8 knots as we made our way towards the Needles. The Solent narrows and the tide pick up speed through Hurst Gap, created by a spit of land which extends most of the way across the Solent. Just as we came through the Gap, someone said “wow, look at the sunrise behind us”. We turned to look and were greeted by a fantastic blood red sunrise, supposedly forecasting bad weather but looking fantastic. By approx. 5.30am, we were at the Needles. “Approximately” was clearly not good enough for Roger, who informed us we were 3 minutes behind schedule and if we didn’t catch it up by our scheduled breakfast stop, we’d have to knock it off the time allocated to breakfast. Harsh, I thought. 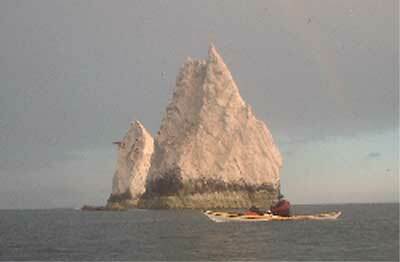 The dreaded tidal overfalls at the Bridge were no where to be seen, so we ‘threaded’ the Needles – paddling through the gaps between the vertical stacks of rocks that form the needles. The weather couldn’t have been better for us at this point, and we were greeted by a double rainbow which had formed over the rock formation. A moment of calm reflection, i.e. “what the hell am I doing at the Needles at 5.30am on a Saturday morning when I could have been in bed! ?”, then off again, this time to our breakfast stop location – Freshwater Bay. Obviously a misnomer, as the beach smelt nothing like “fresh” water, still it was 6.30am, I’d been paddling since 3am, and nothing was going to put me off my cooked breakfast! Thankfully, Roger allowed us our full amount of scheduled time, as we’d recovered the three minutes lost by the time we got to Freshwater Bay. Unfortunately, our departure was delayed by 15 minutes due to the skeg on my boat being jammed by the loose stones from the beach. After some cord had been attached to the thankfully pre-drilled hole in the boat’s skeg we were off once again. From Freshwater, our next obvious destination was St Catherine’s Point – familiar to anyone who has obtained an inshore waters weather forecast for the South Coast. 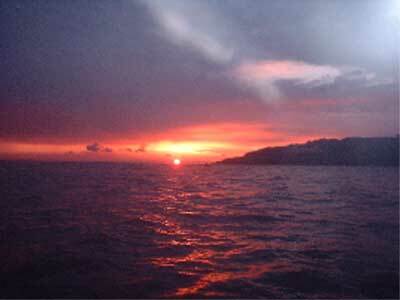 Thanks to the earlier sunrise, we could now see our destination approx. 15 miles away from where we were and it looked a long way from where we were. Thankfully the weather was behaving itself, giving us north-westerly, Force 3-4 winds, with plenty of sunshine, so the journey to St Catherine’s Point was a pleasant one. With the assistance of the tide, we’d made the point by approx 10am, hitting the overfalls just as they were coming off their strongest flow. Because the weather was behaving itself, the ride through the overfalls at the point was nothing more than a bumpy ride through small standing waves, which gave a welcome relief to the flat water we’d paddled through so far. Our thoughts immediately turned to spending some time playing, however Roger pointed out that we were 8 minutes behind schedule, so couldn’t spare the time…! We stopped for a short rest and comfort break on a beach just east of St Catherine’s Point. As we approached the beach we encountered a small following sea and I was quickly able to use this to my advantage as the P&H Bahiya demonstrated its ability to catch the smallest of waves and track perfectly true whilst surfing. 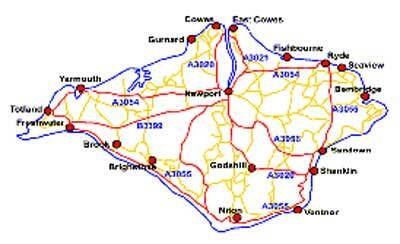 By now we’d turned towards the North East, and were soon making our way past Ventnor, one of the IoW’s big resorts. We’d been paddling for over 7hrs, yet I’m sure people on the beach were only just taking their early morning walks! From Ventnor, a straight paddle across the large bay that Shanklin and Sandown were located in would take us towards Bembridge, the eastern point of the IoW – a tidal gate, and one that ideally we needed to reach by 12.15pm before the tide started to ebb and run against us. At Bembridge the ebb tide separates into two flows, one heading southwest against us if we hadn’t made it, and another flow heading northwest, potentially carrying us further on if we’d made it in time. Unfortunately, the tide started to turn against us with a couple of miles to go. We knew we had to keep going to get past Bembridge so we hugged the coastline to hopefully catch any assistance from any eddies created by the points extending into the sea. Coming around one such point, we were surprised to find a small overfall much like Penrhynmawr on a really calm day only just after it’s started to run. Even more surprising was that this was located about a half mile from a public beach where kids were playing in their cheap inflatable dinghies. As an experienced beach lifeguard the thoughts of an offshore winds, combined with an overfall at one end of the beach made me glad that we weren’t hanging around for longer. I wondered how many kids in inflatables had made unplanned runs through the overfalls! Around 1.30pm we rounded Bembridge Point and landed near to the Bembridge lifeboat station, where Roger reminded us that we had to leave by 2.15pm. We’d found shelter from the wind and shortly after we’d eaten our lunches some of us grabbed a quick snooze whilst others kept the public entertained with tales of how far we’d been and where we’d come from. Bembridge Point was meant to be a psychological boost, as rounding it meant that we were now heading north west on the last leg of the circumnavigation and back to the beach at Calshot. We were on time, unless you were Roger, in which case we were 8 minutes late, and we only had 15 miles less to do having done 45 miles already. We set off at 2.20pm, newly fuelled up after our lunches; however it soon became apparent that the final 15 miles was not going to be the easy paddle we’d thought it would. We had to paddle quite a distance offshore to avoid the tidal eddy flow near Ryde working against us; however this meant that we were more exposed to the north-westerly head wind, into which we were now paddling. 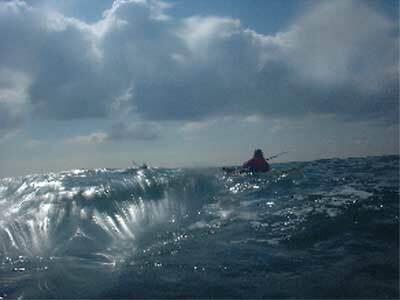 Although, not an overly strong head wind, paddling into a force four wind after 45 earlier miles was rapidly proving to be difficult. We made slow progress along the north east coast of the Isle of Wight, made all the worse by our final destination being so obviously sign posted by the tower at Fawley Power Station. We knew from the tidal atlases that we only had a limited amount of time before the tide joined the wind in opposing us. We soon realised that we were not going to achieve our estimated time of arrival at Calshot, it becoming rapidly apparent when we barely made it to the end of Ryde Pier without being run down by either the hovercraft or fast catamaran ferry. We regrouped at the end of the pier realising that we had to devise a new plan to take into account our tiredness, the wind and the tide. As a group, we knew that we had to rest and sit out the worst of the wind. Looking at the tidal atlases, there was an opportunity for some tidal assistance during the crossing from Cowes to Calshot from 7pm onwards. It was now only 4.30pm, so we headed for the nearest beach to grab some rest and more food. Shortly after landing at the beach, I blinked and woke up 45 minutes later to find everyone else asleep on the beach, clearly the 50 or so miles we’d already paddled was taking it’s toll! Around 5.30pm, I phoned Solent Coastguard to get the latest weather report, which still looked manageable. We set off, determined this time to reach Cowes, and make the crossing back to Calshot. We still had the wind against us and to make matters worse it was joined by rain – the first of the day. We reached East Cowes, just as Cunard decided to join in the sustained attack against us, launching the Aurora and one other large cruise liner to pass within a few hundred metres of our bows as we started the crossing. I don’t think you truly realise how big these ships are until you’re sat that close to them in a sea kayak as it cruises past you. Jokes about how ‘the ship’s crew wouldn’t even notice the little ‘speed bumps’ we were in as they ran in to us’ rang through the group. The laughter soon abated as we refocused on our destination, Calshot. The final crossing was uneventful, being nothing more than a slog through the wind and tide to get back to Calshot. 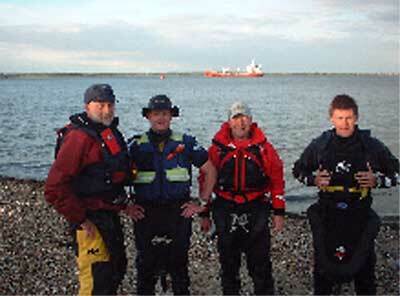 We arrived at Calshot at 8.20pm – 56 nautical miles and 17 hours 30 minutes after starting. We’d succeeded in our objective of paddling around the Isle of Wight in one day, and the sense of accomplishment combined with the sense of relief that it was over was fantastic! And, just for the record, Roger did not tell us how many minutes we were late to Calshot by! Throughout the trip, the P & H Bayiha that I had borrowed performed extremely well. The boat tracked well and proved to be a fast sea kayak. Whilst we weren’t out to set records that day, the speed of the Bahiya allowed me to paddle very efficiently which definitely assisted me to complete the whole paddle. · Phil’s parents who acted as support crew, circumnavigating the island by car in case we needed assistance. · Calshot Activity Centre for allowing us to use their car park. Graham Beckram, ‘Bertie..’ to his friends, lives in a small village close to the Dorset coastline. By day he is an office boy in Dorset’s ‘Big City’ - Bournemouth, but when not working he is an aspirant Level 5 sea coach, Level 4 inland, sea and surf coach, and a member of Weymouth Canoe Lifeguards and Poole Harbour Canoe Club. When not working or kayaking, he spends his time repaying his brownie point debt to his wife. Roger Hiley, by day a farrier, but by night clearly a time-obsessed maniac who should never be allowed to look at a watch again. And finally...Phil, who took time out from his busy schedule of sailing around the world in various tall ships, to join us.